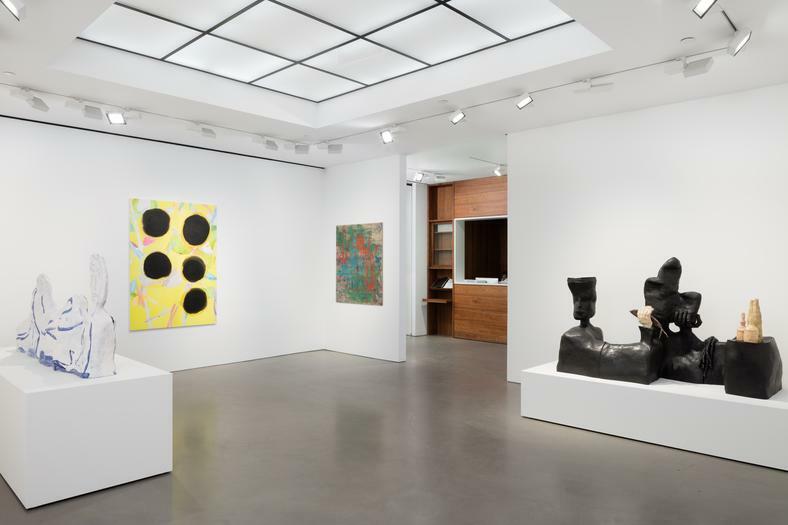 Andrea Rosen Gallery is delighted to announce our next exhibition at Gallery 2 featuring the work of Paul Heyer, Jeanette Mundt, and Jesse Wine. In the aftermath of modernism, past the tip of Alfred H. Barr's diagrams, how might the most persistent media continue to reflect the lives we live? How does the texture of a painted surface or a molded imprint in clay feel like today, when time and history collapse and weave together into one substance? What does it mean for a work to be relevant and what's at stake when we ask this question? 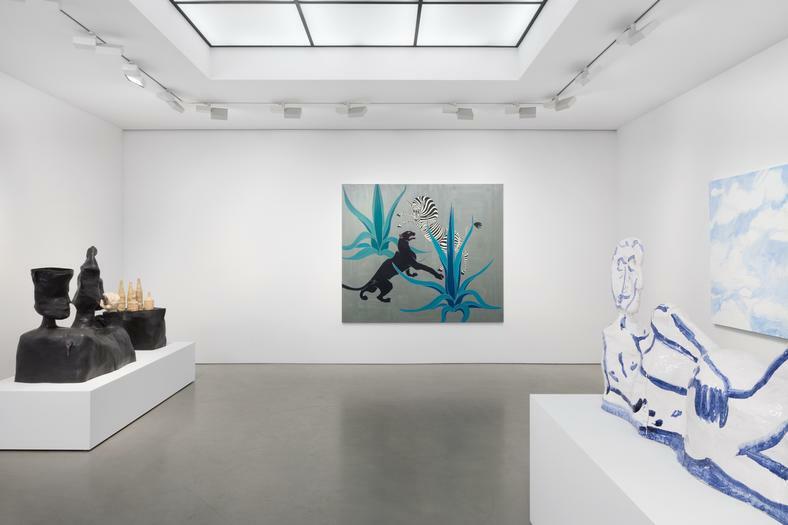 All of the works in this exhibition reflect the realities of how life unfolds: looking forward, but through tinted glass revealing as much about what's behind as what could lie ahead. Paul Heyer makes paintings that reflect the freedom possible in contemporary painting. His work unmoors itself from the didacticism of American abstraction and self-reflexively seeks to picture the future while conjuring moments in the history of painting. Fragments of bodies - recalling those by El Greco - extend the old master's mannerist invention with Heyer's bright palette. Next to a painting of the sky or a painting formed solely with shiny, silver fabric, Heyer's work pushes against the limits of painting as a medium. In her work, Jeanette Mundt utilizes a broad range of cultural sources, ranging from the personal to found images to specific paintings from the historical canon. In her work, these varieties of images and the hierarchies between them are collapsed. Mundt often works in series, reprising an image again and again as if testing the possibilities of representation. In this exhibition, Mundt shows a selfie painting against paintings depicting a mural by Charles Baskerville in the home of Marlene Dietrich designed by Elsie De Wolf. Seemingly disparate, both these works represent the impulse to project images of one's self. 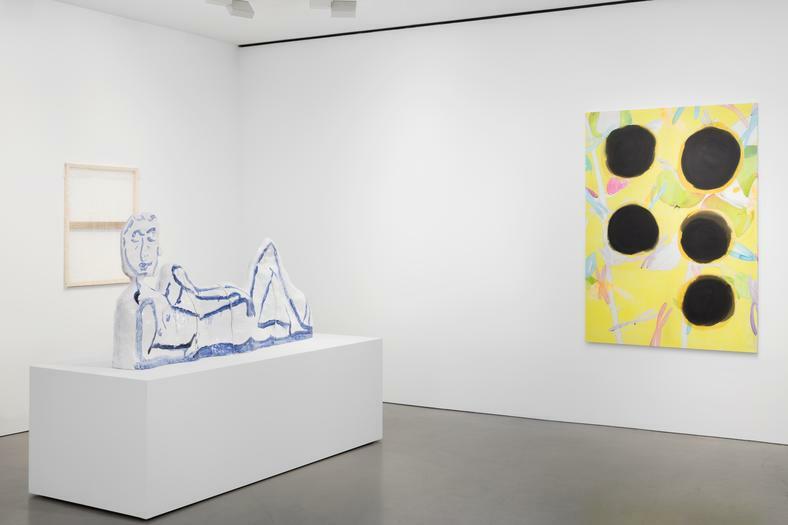 Composed of glazed ceramic, Jesse Wine's sculptures figure everyday, quotidian objects alongside direct citations of historical artworks that make up a shared cultural landscape. The tactility of clay and the beautiful, glazed surfaces that Wine achieves articulate an idea of making, time spent in the studio, and the way that art comes into being. Presented here are two horizontal figures, one reclining and the other fragmented into body parts. In each, a series of images or thoughts combine into a sense of meaning without concretizing into a distinct, static narrative. "If we assume, then, that life in art, beyond professionalism, is about negotiating ways to continue (our life, work, relationships, history) together, it seems that in and through art certain terms could be proposed for a generational contract that, drafted in an irreverent spirit of determinate indeterminacy, will allow us to keep things in a state of becoming - saving the last dance for each other, for someone special, for quite some time." Paul Heyer (b.1982) received his MFA and BA from Columbia University in 2009 and 2004, respectively. 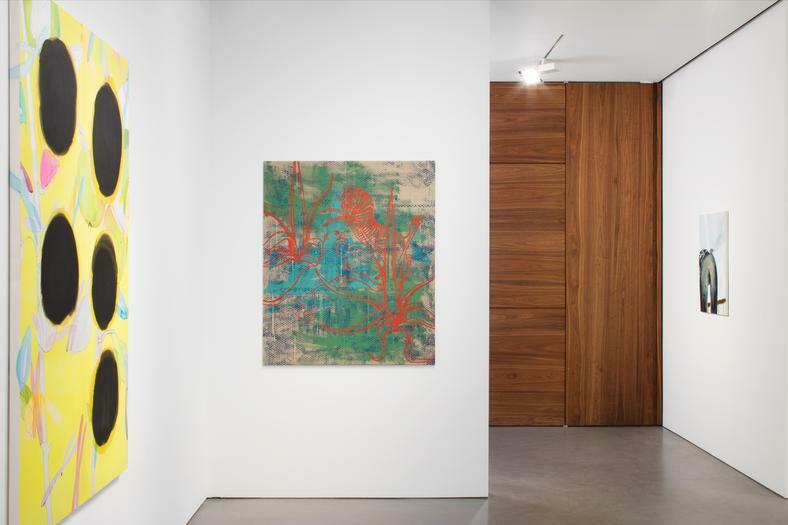 Heyer has exhibited throughout the US at such venues as Night Gallery, Los Angeles; Chapter NY, New York; Rachel Uffner, New York; Daniel Reich, New York; Rodeo Gallery, London; and Shane Campbell Gallery, Chicago. His work has been written about in Artforum International and The New York Times. Heyer lives and works in Los Angeles. Jeanette Mundt (b.1982) received her BFA from the Pratt Institute in 2006. 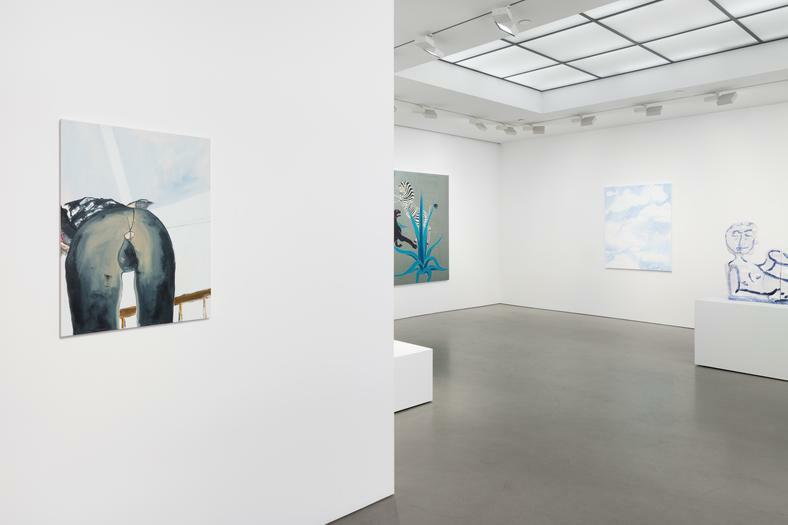 Mundt has exhibited throughout the US and abroad, with recent solo shows at Off Vendome, New York; Société, Berlin and Clifton Benevento,, New York; as well as group exhibitions at Greene Naftali Gallery, New York; CAPC, musée d'art contemporain, Bordeaux, France; and Mitchell-Innes & Nash, New York. Mundt lives and works in Brooklyn. Jesse Wine (b. 1983) received his MA in Fine Art from the Royal College of Art, London in 2010. Recent solo exhibitions of his work have been held at Gemeentemuseum, Den Haag; the BALTIC Centre for Contemporary Art, Gateshead; Limoncello Gallery, London; and Mary Mary, Glasgow; his work has also been included in recent group exhibitions such as the British Art Show 8 at Leeds City Art Gallery, Leeds and group shows at TATE St. Ives, Saint Ives and Fondation d'Enterprise Galeries Lafayette, Paris. Wine was the recipient of the Camden Arts Ceramics fellowship in 2013-2014. He lives and works in New York.